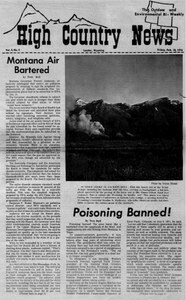 Montana Governor Forrest Anderson effectively sabotaged that state's air pollution program by refusing to sign the proposed implementation of federal standards. Poisoning banned! The news burst like a bombshell over the rangelands of the West. And repercussions are still echoing from Montana to Texas. The Nixon administration went against the advice of its own environmental experts and refused to sign an executive order regulating clear-cutting.